You can use many different FTP applications to transfer your files to your website. Although their interfaces may be somewhat different, most FTP applications allow you to do the same things with your files, such as viewing a listing of files by name, date, and size, creating directories, and allowing you to transfer, copy, rename, and delete files and directories on the remote server. Standalone programs: Standalone programs, such as WS-FTP, FileZilla, Cyberduck, or Fetch, must be installed on your local computer and launched like any other program each time you need to access the remote server. You may use the same program to access as many sites as you like, as long as you have the correct URL, username, and password combination for each domain. Each site can have its own server profile. Saved profiles archive the FTP URL, username, and password information to make future logons faster. Though some FTP programs have a drag-and-drop interface where you can drag files from your local desktop into the remote view of the host server, most programs consist of a single window with two panes that represent views of the local site files and the remote site files. Data may then be transferred both to and from the remote server using common interface controls such as Get, Put, Change Directory, Make Directory, Rename, Delete, and Refresh. Integrated application: Some FTP clients are built-in components within other programs that allow you to transfer files to and from a specified remote server through a special FTP panel. For example, Dreamweaver’s Files panel can be used as an FTP tool. When you expand the Files panel, you can even see both the remote and local views of the files being transferred and can transfer files in either direction. Internet control panel: Your host provider may include some kind of special Internet control panel through which you can transfer files to and from the host server. These panels are often customized web interfaces developed by host providers and are composed of a handful of specialized web forms. These forms allow you to upload files to the remote server and occasionally to also select and download files from it. 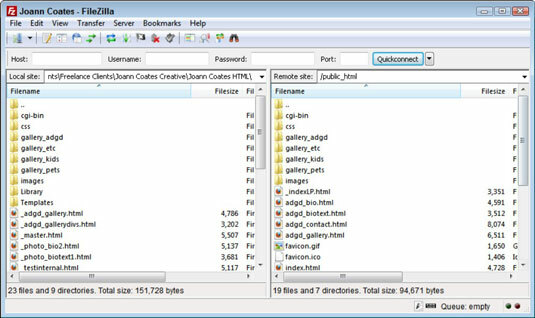 Most control panels restrict uploads to single files at a time, rather than enabling users to specify and upload several files or folders at once. Control panels also rarely let clients have full control over the files on the remote server and may even restrict access to certain tasks, such as renaming and deleting files. Browser interface: Many browsers include an FTP client interface that allows you to access the remote server with a simple Internet connection from your local computer. With some browser interfaces, you establish a connection to the remote host by entering an FTP address into the address bar, after which time the browser prompts you to enter a username/ID and password. Other browser interfaces employ the use of special browser plug-ins or add-ons, like the FireFTP add-on. After the FTP address, username, and password have been submitted, that information is then passed to the remote server and authenticated when the logon information is correct. After the connection is established, the same browser window is used to display the files and directories on the remote server, into which you may drag and drop files from your local computer. If you use Dreamweaver or some other HTML coding application that has its own built-in FTP tool, feel free to use that tool to transfer your files to and from the remote server.